Please consider making a donation towards the restoration of this Grand Historic Auditorium. The Brandon Auditorium was built by the WPA in 1936. In 1985 the building was placed on the National Register of Historic Places. Claybaugh Preservation Inc. and Orb Management are presently working on plans for the repairs that need to be done. Picture from The Record. Millerville Mayor Bryan Tolifson unveiled one of several framed collections of photos from Millerville's past. The unveiling was done at the Feb 21 fundraiser to help preserve the Brandon Auditorium. 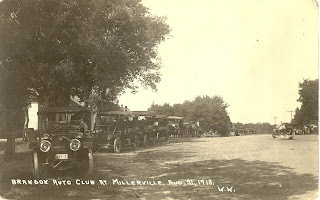 All of the new Millerville pictures may be viewed at the Brandon History Center. Picture from The Record. The Feb. 21 fundraiser evening included the unveiling of a special display honoring the two Brandon residents who have served in the Minnesota House of Representatives, Dave Fjoslien and Hilda Bettermann, who is shown below along with Brandon American Legion member Lydon Sletto. Picture from The Record. The Feb 21 fundraiser to help pay for repairs on the Brandon Auditorium was a packed house as hundreds showed up to take part in the festivities. There were games, music, tap dancing, a silent auction, just good old-fashioned conversation, lunch including pie and ice cream. A good time was had by all who attended. In 1935 Richard put together a tractor. The motor was a 4 horse power inboard boat motor. The clutch from a model T-Ford was used. The transmission was a 3-speed from a Star car. The back wheels were from an old horse mower and the front wheels were from a model T-Ford without the tires. It was driven on the rims. This tractor pulled a 2-wheel trailer which they used to haul straw in the horse barn or haul wood home. Seidlinger's Harness Shop was located on Front Street to the East of the Brandon Car Wash location. 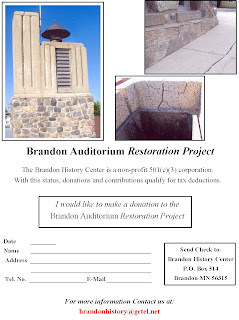 We want to extend a huge thank you to everyone who attended the Brandon Auditorium Restoration Project Fund Raiser and Silent Auction. We feel it was a great success and was enjoyed by all. A special thanks to the Brandon School BPA Class, the Industrial Arts Class and the 3rd and 6th grades for their help with this event. Thanks to the Record and the Echo Press who published informative articles alerting the public of the importance of the restoration of this Grand Historical Building. We want to thank everyone who donated auction items, money and to the volunteers who used their time and talent to make this event so fabulous. Board members of the Brandon History Center. This picture was taken August 31, 1913. Zoom up and notice the chickens in the center of the road. Notice the horses and wagon.